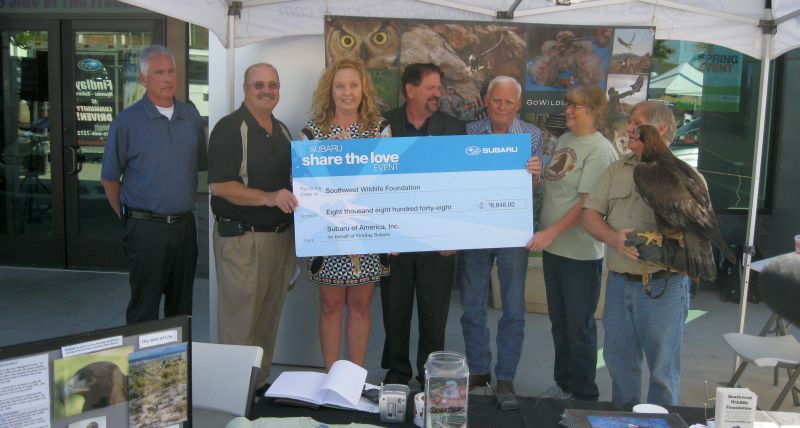 ST. GEORGE — Subaru of America Representative Christina John was on hand Friday morning at Findlay Subaru in St. George to present Martin Tyner, CEO and founder of the Southwest Wildlife Foundation of Utah, with a check totaling $8,848. The annual Subaru Share The Love event allows those who purchase a new car from the dealership to select one of four charities to have money donated to. The dealerships can also choose a local charity to have money donated to as well and, this year, Findlay Subaru of St. George chose the Southwest Wildlife Foundation as their charity. During the check presentation, Tyner had an assistant named “Scout” literally on hand with him to help accept the donation. Scout is a golden eagle who was rescued after a Wyoming farmer contacted Tyner and told him he would have to shoot the eagle if Tyner was unable to rescue it. 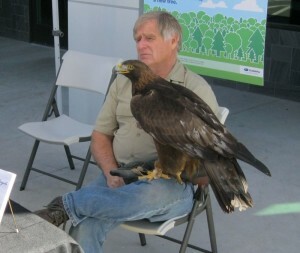 Tyner was successful in rescuing Scout, and now the eagle is a regular part of his entourage when he gives presentations on behalf of the foundation. “This is going to buy a lot of animal food, right Scout?” Tyner said as he accepted the check. Scout seemed to approve as he began flapping his wings enthusiastically. The Southwest Wildlife Foundation of Utah is based in Cedar City and is dedicated to wildlife rescue and wildlife education, according to the foundation’s website. Caring for over 100 sick or injured animals each year, the goal of the foundation is to return as many animals to the wild as possible, the site said. If an animal cannot be rehabilitated, the foundation will provide a place for the animal to live in the Cedar Canyon Nature Park.